For Device Control to function on a device, you must have the local scheduler agent and the standard agent deployed on that device. Every time the device initiates a device connection or makes changes to a device connection, the agent applies setting rules. These rules include terminating connections that aren't allowed and sending alerts to the core server. Click Tools > Security and compliance> Agent settings. Under All agent settings, right-click Device Control, and then click New. On the General Settings page, enter a Name. Select the Enable device control check box. On the other pages, customize the options you want. For more information about the options on the dialog box, see Agent settings: Device control. Under Endpoint security, double-click the endpoint security setting that you want to use to apply the device control settings. 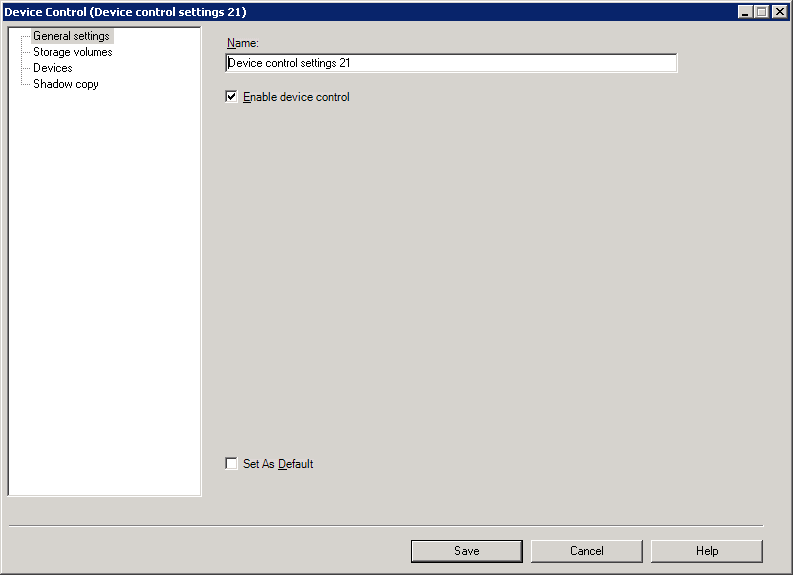 On the Default policy page, check Device control and select the device control setting that you want to apply.